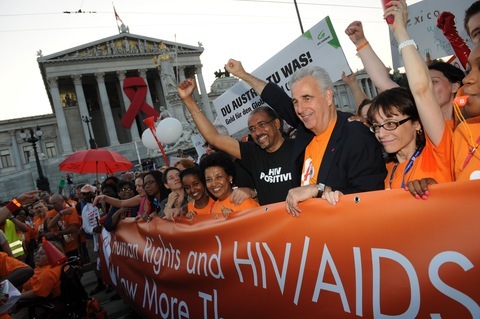 VIENNA, Austria | This year’s International AIDS Conference, drawing to a close Friday, produced among other things a high-profile scientific breakthrough, endless policy discussions and plenty of new research to digest. In the biggest news of the conference, a team of researchers from South Africa presented the first solid evidence that a microbicide gel could provide a significant level of HIV protection for women. Using 1 percent tenofovir, an antiretroviral, the gel reduced HIV infection by 39 percent among all the women in the trial, and 54 percent among women who used the gel in at least 80 percent of sexual encounters. The protection the microbicide gel provided should be improved and it likely won’t be rolled out soon, said Cohen, but it’s a solid foundation on which to build. “Cure” has been treated like a four-letter word by the HIV/AIDS research community for years now, said Cohen, because of past disappointments and the sense that it was sapping time and money away from research for prevention and treatment. But dozens of presentations at the 2010 conference talked with new hope about defeating HIV. Two of the main approaches being discussed are suppressing the virus to an extremely low level permanently so that medication would no longer be needed, and eliminating HIV from the body entirely. Even HIV positive patients who have controlled the disease well with antriretroviral drugs still have virus in their bodies that necessitates staying on those drugs, a costly, life-long proposition. Research is showing that in these patients, a reservoir of HIV can collect in cells that remain dormant and sleeping for years, said Cohen, then suddenly release more virus, especially if treatment is stopped. “They are coming up with strategies to tickle those cells to spit out the virus so they can mop it up” with medication, he said. Despite the number of HIV positive people around the world, “sexual transmission of HIV is extremely inefficient,” Director of the National Institute of Allergy and Infectious Diseases Anthony Fauci said during his plenary presentation at the conference. Understanding just what the virus has to do to successfully infect a person is growing, and that information is critical to building effective early interventions, he said. “People have been studying transmission since they discovered HIV causes AIDS but they are starting to get really detailed descriptions of what type of cell the virus prefers,” said Cohen. HIV has to find an activated CD4 cell in order to infect and begin replicating, and Fauci and his team found that cells with a specific kind of receptor, called an alpha 4 beta 7, are particularly vulnerable.